Perhaps most notable of the Olmec inventions was the calendar. The ancient Olmecs implemented a 260-day sacred calendar as well as a 365-day solar calendars. Their calendar was based off of their base-20 numbering system, which even included the number zero, a very advanced mathematical concept for the time. They also established a system for measuring time that may have been used in later Mesoamerican civilizations. Olmec tablet, along with the 62 characters on the tablet. Although still controversial, there is evidence that the Olmecs developed the earliest example of writing in the Americas. In 2010, a scroll dating back to 900 BCE was discovered in an ancient Olmec temple mound, showing evidence that they developed the earliest writing in the Americas. 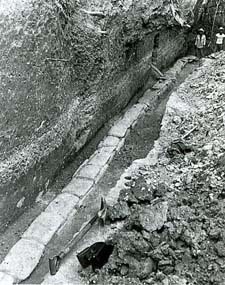 Other innovations by the Olmecs included the elaborate water and drainage systems in San Lorenzo. At least twenty human-made water storage ponds were in the city of San Lorenzo. Another important innovation was the tapping of rubber. The name Olmec literally means "rubber people" in Nahuatl. Historians believe that the Olmec were the first civilization to tap rubber in order to make and trade rubber objects. FUN FACT! The Olmecs were the first to consume chocolate, originally in the form of a drink. The most famous Olmec artwork is perhaps their massive stone heads. These colossal heads were meant to glorify their rulers. They carved mainly basalt and jadeite, imported from across vast distances, using only the stone tools they had at the time. Aside from these massive heads, they carved altars as thrones for their kings as well as niches which represented the portal between the supernatural and natural worlds. Other than stone carving, the Olmecs also were excellent potters. They made clay figurines, often depicting the transformation of their shamans or images of infants, believed to be effigies for the infants before their sacrifice. They also made cave-paintings, mostly found in the mountains of present-day Guerrero.